I took this shot 5 years ago in Cairo, Egypt before the arab spring. It was shot at full stretch 150mm on a Olympus E-510 on a misty day so there was barely any contrast. This is a good example of the advantage of setting your camera to shoot in RAW if you can. A great deal of detail can then be recovered with careful processing. The Pyramids are 10 miles from the centre of Cairo. The view from the far side has none of the city in it. That’s pretty impressive the amount of detail you’ve rescued from the file there. Thanks, Rescuing detail is what I do for a living The RAW file is 12bit so even with the low contrast it is possible to extract enough information to remap the tones on to an 8bit jpg. Hello, Would you be so kind to share the knowledge where the photo was taken from? 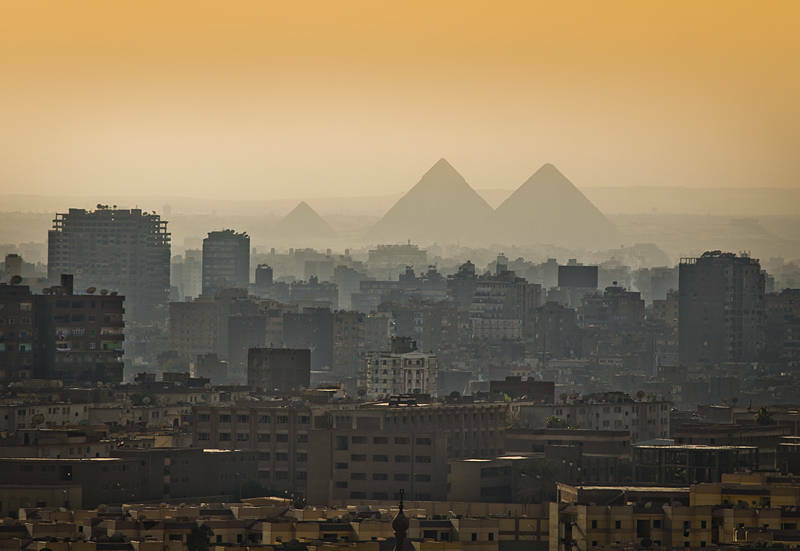 It’s amazing perspective of pyramids with the city. I went through the whole internet and I cannot find this information while I will have only a few hours in Cairo so not much time for exploring. It was taken from the Great Mosque of Mohammed Ali on the Hill. Have a safe trip. Thank you very much for info! Just a quick one more question: was it from minaret? Is it accessible for everybody, I mean open to public? Thanks, I think it was from the wall outside the Mosque. It was open to the public 10 years ago when I took the picture.